Shrove Tuesday Pancake Dinner and Game night!! 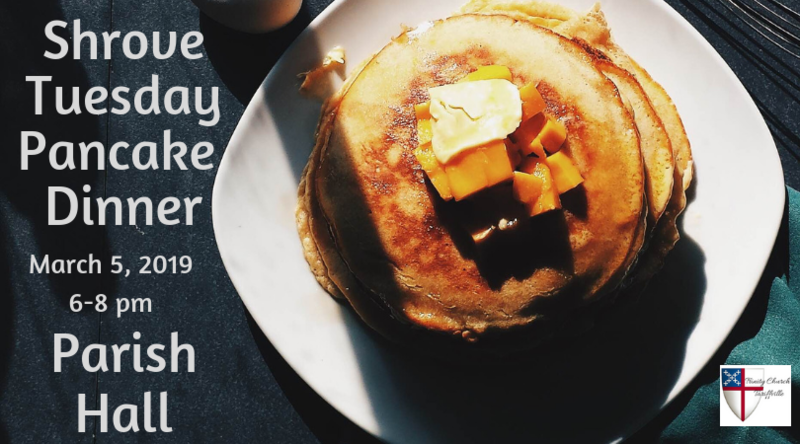 Shrove Tuesday Pancake dinner is next week! Shrove Tuesday Pancake Dinner! - Shrove Tuesday is this Tuesday in the Parish Hall from 6-8 pm. There will be pancakes and kids’ games. The cost is $3 per person with a family max of $10. The funds raised will again go to the Youth Fund. If you don’t feel like making dinner on Tuesday and you do feel like hanging out with your friends at church. This is the perfect mid-week opportunity. 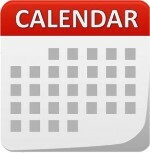 Sunday School- Regular Sunday School this week! Youth Group- Middle School Youth group will meet at 11:30-1 pm we will be doing some crafty things this week. The senior high will meet from 7-8:30 for Dinner and Worship. Paint Nite- We have 30 people signed up for Paint Nite this coming Saturday. That means there are just a few more spots, so if you want to join us now is the time! 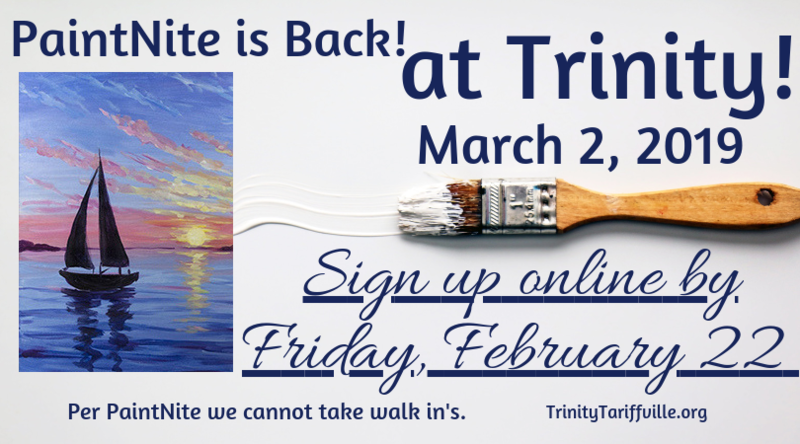 PaintNite stops taking registrations at midnight on Friday so get your tickets now! Camp ROAR- Camp Roar already has 12 campers signed up!!! Our goal is 40 campers so keep sharing the registration info with all your friends. The Volunteer registration is holding steady at 11. Thank you all for signing up so early. This year we have started a nursery and preschool group lead by Lindsey and Jake Salomonsson. They are super excited to be leading the charge with this new group of kids. Taking care of these younger ones will also mean that more moms can volunteer as leaders and helpers! Camp ROAR is doing wonderful things already! 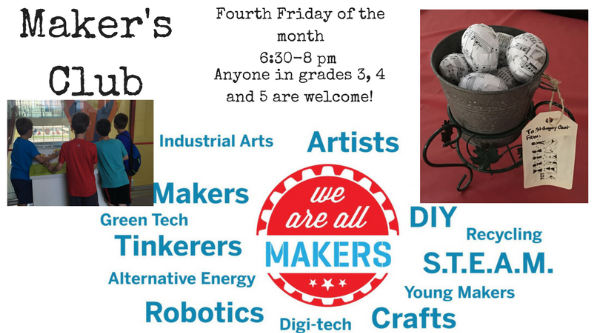 Makers Club- We missed a couple months of makers club because of scheduling conflicts so our next Makers club is this Friday!! From 6:30-8 pm any student in third, fourth, or fifth grade is welcome to join us for pizza, a short lesson, and a take home craft. Let Manda know your child is coming by tonight! Youth Group- There is no youth group this week because I am going to be away. We begin again March 3rd with Dinner and Worship. Friday Family Worship (Formerly Big 3 Dinner)- is tonight! We are going to swap it up, Worship will be first and Dinner will end the evening. Worship is at 5:30 Dinner will be at 6:30. Camp ROAR- Camp Roar already has 12 campers signed up!!! Our goal is 40 campers so keep sharing the registration info with all your friends. The Volunteer registration is at 11 as well! Thank you all for signing up so early. This year we have started a nursery and preschool group lead by Lindsey and Jake Salomonsson. They are super excited to be leading the charge with this new group of kids. Taking care of these younger ones will also mean that more moms can volunteer as leaders and helpers! Camp ROAR is doing wonderful things already! Makers Club- We missed a couple months of makers club because of scheduling conflicts so our next Makers club is coming up soon! Put Friday March 1st on your calendar! From 6:30-8 pm any student in third, fourth, or fifth grade is welcome to join us for pizza, a short lesson, and a take home craft. Let Manda know your child is coming by Wednesday Feb 27th. Youth Group- There is no youth group this week, for teacher’s meetings, or next week, Feb 24th, because I am going to be away. We begin again March 3rd with Dinner and Worship. Paint Nite- We are going to have a Potluck, Paint Night, Fundraiser on Saturday March 2rd from 5:30-8 pm. You can sign up for this event online by clicking this link: https://www.yaymaker.com/events/_10135509 Or sign up in the Narthex I will purchase your tickets through the website, and you will need to bring a check to church. Also, Paint Nite has changed its name to Yay Maker. If you choose to purchase your own tickets, the website will look a little different, but do not be alarmed, it is the right website. 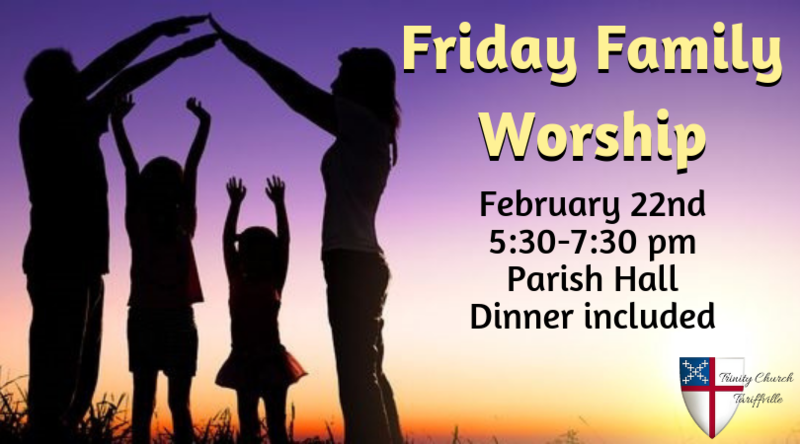 Friday Family Worship (Formerly Big 3 Dinner)- Friday, February 22nd at 5:30 pm we are going to do our first Friday Family Worship night. This is going to be geared toward families with young kids who want to be able to worship together. We will begin with family style dinner provided by the St Elizabeth crew. Then we will do a kid friendly worship service and be done by 7:30. I hope to see all of you there! Camp ROAR- Camp Roar already has 10 campers signed up!!! Our goal is 40 campers so keep sharing the registration info with all your friends. The Volunteer registration is at 10 as well! Thank you all for signing up so early. This year we have started a nursery and preschool group lead by Lindsey and Jake Salomonsson. They are super excited to be leading the charge with this new group of kids. Taking care of these younger ones will also mean that more moms can volunteer as leaders and helpers! Camp ROAR is doing wonderful things already! Sunday School- DIGG church this week. We will begin in the chapel before heading up to the fellowship hall for music and snack. Youth Group- We are going to have both youth groups come to the Senior High Youth Group Dinner and Worship night on Sunday. We will meet at 7pm in the Youth Room for Pizza from Marco’s and Salad. Please let me know ahead of time if your student is coming so I can get enough food. https://www.yaymaker.com/events/_10135509 Or sign up in the Narthex I will purchase your tickets through the website, and you will need to bring a check to church. Also, Paint Nite has changed its name to Yay Maker. If you choose to purchase your own tickets, the website will look a little different, but do not be alarmed, it is the right website. And Don’t forget the Valentines Dance this Saturday. It is for high school age and up! Tickets are $5 and are sold at the door. Wear whatever fancy clothes you have and dance the night away!